Not everyone will like feel of pads; some sounds need a tweak. Following in the footsteps of the DM10 Pro, DM10 Studio and most recently, the DM10 Studio 2011, the DM10 X is the latest electronic kit based around Alesis' top of the range 'high-definition' DM10 drum module. The DM10 was the first of its kind to have the ability to load completely new sound sets via the USB interface and has more features than you can shake your sticks at - with over 1,000 samples, stunning playalong sequences, icon-driven menus, full sequencing capabilities, USB and MIDI. "Letting either the crash or ride samples decay naturally, rather than 'choking' produces a slow and realistic decay, demonstrating the quality of sample." 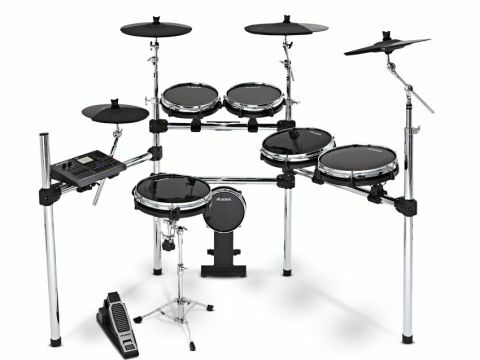 The rest of DM10 X kit is all pretty comprehensive too, featuring a heavy-duty four-post 'XRack', boom cymbal arms, hi-hat pad (with newly-designed controller), three cymbal pads (ride and two crashes), six drum pads (snare, bass drum and four toms), wiring snake, manuals and, in a break with tradition, a separate snare drum stand chosen to help cut down on any possible cross-talk. The base of each of the DM10 X's drum pad is formed from a single piece of injection-moulded plastic. The first of two Piezo transducers are fitted into the base itself, with a second residing on a metal plate sandwiched in between two layers of foam. It's the task of the foam to help isolate the stick strikes and placement, giving 'real' sticking actions such as rim-shots, all of which are interpreted by the DM10 module. A plastic ring acts as both 'shell' and bearing edge over which the Mylar head and a standard triple-flanged hoop is attached. The chromed tubular steel rack is designed to be set up in three basic 'H' sections fixed together by clamps and brackets. These are made from a tough impact-resistant plastic, and have winged nuts for adjustment and the ability to firmly lock the pads in position. The DM10 module has a large contrast-adjustable backlit graphic display and a menu system that's accessible via the minimum amount of buttons, some of which are dual function - some controls including the function keys, mixer faders and value wheel are similarly laid out to those on Roland's TD20. The six mixer faders have two banks (A and B) each giving control over the volume of 12 separate voices. Many of the samples are uncompressed and sampled from many of the classic top-end drums - leaving the user to add those nice frilly bits like compression, reverb, EQ etc, and the whole system can be backed up via a computer. Before hitting any of the kit, we first took a sneak preview of each of the pre-loaded songs The first few clicks of the metronome (with its 'stick shoulder click'), caught us completely unaware - the sound is surprisingly realistic and impressive. The revelation continues with such intuitively named tracks as 'SOS' (strong reference to a certain Police track), 'SD Rock' (Steely Dan style) and 'Texas Blues', which has a great Strat rhythm chunking away within it. There is a complete range of styles from urban to indie to house to big band - all with feel, musicality and skilfully programmed. However, the playalong tracks are merely a taster of the kit's capabilities. Intuitive graphics provide a hint as to the genre and help the user to choose the kit or individual drum sound quickly and with ease. Once we started playing the kit, our sticks bounced around the pads with a reasonable feel - we actually prefer the feel of the cheaper Alesis rubber pads! However, it's the excellent sounds coupled with Alesis' 'Dynamic Articulation', (the company's proprietary method of creating subtle changes in timbre, depending on how hard the pads are struck), which really gives it its air of realism. Letting either the crash or ride samples decay naturally, rather than 'choking' (which is also readily available), produces a slow and realistic decay, demonstrating the quality of sample. While the overall cymbal sound and drum sound is impressive, there are one or two snares that appear a little too compressed but, of course, this can be tweaked for user preference. Overall the module and pads cope well with our manic and frenzied test performance, taking each strike in its stride without skipping a single beat.